Sketch F Showing the Progress of the Survey in Section VI. With a General Reconnaissance of the Coast of Florida 1848-59. A beautiful example of the U.S. Coast Survey's 1859 triangulation chart or map of the Florida Peninsula. 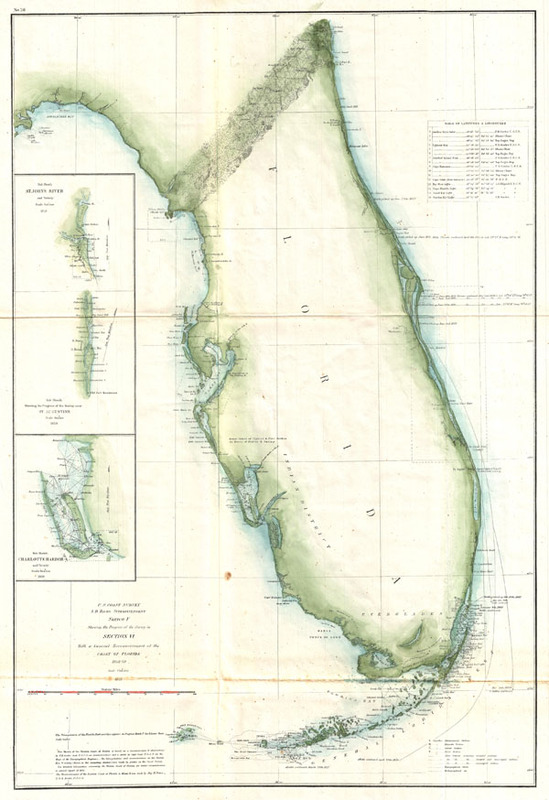 This map covers from St. Augustine and Apalachee Bay southwards as far as Key West and the Dry Tortugas. Triangulation charts of this type were prepared by the Coast Survey before more detailed survey work could take place. They firmly mapped the coastline noting various pointes, inlets, harbors, and Islands. Names Fort Lauderdale, St. Augustine, Key West, and Miami. This particular example features two insets focusing on St. John's River and Charlotte Harbor. The upper right quadrant features a table of latitudes and longitudes identifying major points, cities, and lighthouses. This chart is based upon an initial reconissaice completed by the Coast Survey's resident Gulf expert, F. H. Gerdes. Published in the 1859 Superintendent's Report under the supervision of A. D. Bache, one of the most prolific and influential Superintendents of the U.S. Coast Survey. Ferdinand H. Gerdes (September 15, 1809 - June 27, 1884) was one of the most active members of the U.S. Coast Survey team. His most important work includes several surveys of New York Harbor as well as detailed surveys of Florida, the Gulf Coast, and up the Mississippi River. Gerdes was born in Hanover, Germany (Prussia) and relocated to the United States sometime before 1836, when he joined he fledgling U.S. Coast Survey as an Sub-assistant under Hassler. From 1841 - 1844 he surveyed the New Jersey, Maryland, Delaware Bay Region. In 1844 he was assigned to the Gulf Coast, where he produced his most important and pioneering work. During the American Civil War, like most of the members of the Coast Survey, Gerdes was strongly pro-Union and worked diligently during the Civil War to provide Union commanders accurate surveying and cartographic materials. Gerdes is known to have commanded the ‘Sachem' and, during the Civil War, was heavily engaged with Union efforts to map and ultimately control, the Mississippi River. Following the war he produced detailed surveys of the Passes of the Mississippi. His health and age catching up on him, Gerdes retired to New York, where he completed additional surveys of long island as late as 1883, a year before his death. Very good condition. Even overall toning. Some discoloration and verso reinforcement on original fold lines.